Those of us who want to lose weight and inches know we must burn a sufficient amount of calories in order to do so. When are we burning calories? All the time. Even at rest we are burning calories. Granted it is a minimal amount, but we are burning calories even when we are sitting and watching TV or knitting or reading or painting or talking on the phone. The key is to increase our activity in order to burn more so that we lose that weight and inches. We all know that we must exercise in order to increase our calorie burn. But how can one increase our calorie burn when we are doing sedentary things? When you are talking on the phone, stand up and walk around. Most folks have cell phones so this is easy. When you are watching TV, stand up and do some stretching exercises. When the dishes need to be washed, do it by hand instead of using the dishwasher. When you are knitting or crocheting, stand up and walk around, taking it with you. For some this may be difficult, but try it. When you are on the computer, stand up and try typing. When reading a book, stand up and walk around. You will notice the key words here are “stand up”. Getting from a sitting position to a standing position is movement and burns a few calories. You will find over time that you have become more active and that just sitting is something you can no longer do. You will have become that active person you always wanted to be. 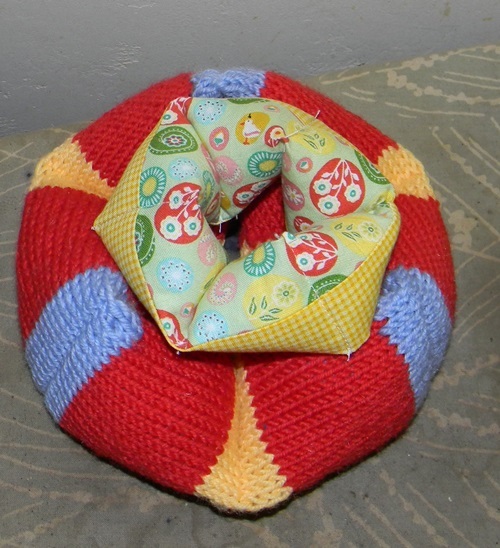 Since knitting my first Kaleidocycle, it crossed my mind that this could also be done using jelly roll strips and a sewing machine. You will need some fiberfill and a stuffing tool. I used the flat end of a straight knitting needle. 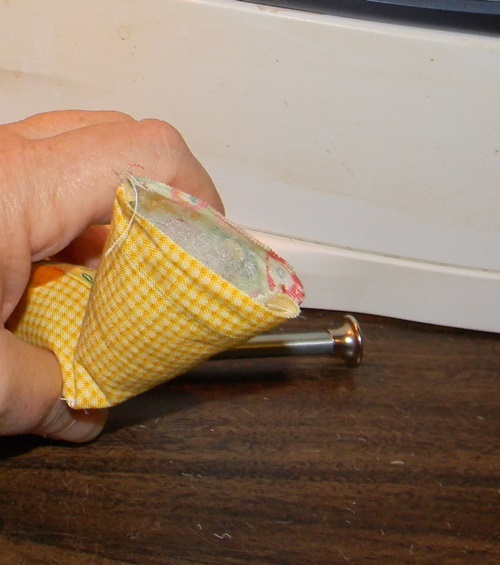 You will also need some heavy duty hand sewing thread such as upholstery thread. 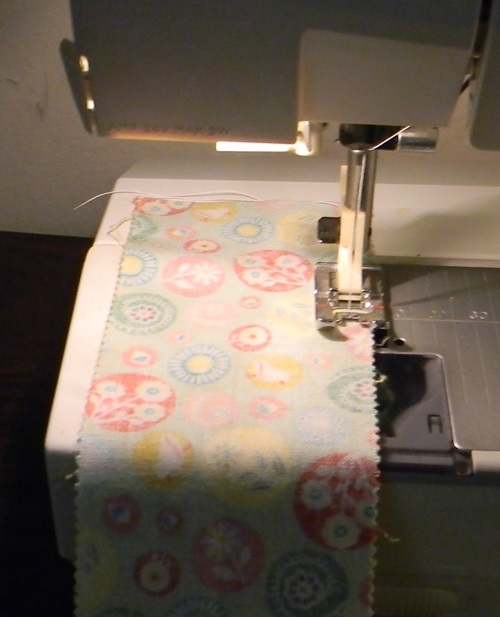 First, pick 2 jelly roll strips in contrasting colors and cut them 13 inches long each. 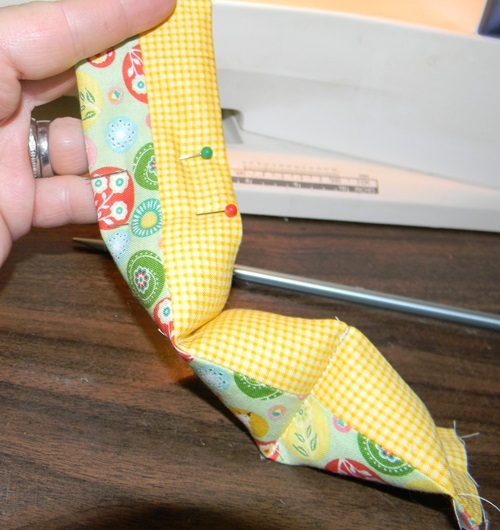 Place right sides together and sew a 1/4 inch seam down one side. Iron this seam open. Repeat for other side. Then turn right side out. Now you are going to make marks along this tube. Your first mark will be 1/2 inch. The next marks will be at 2 inch intervals. You will have another 1/2 inch remaining at the end. 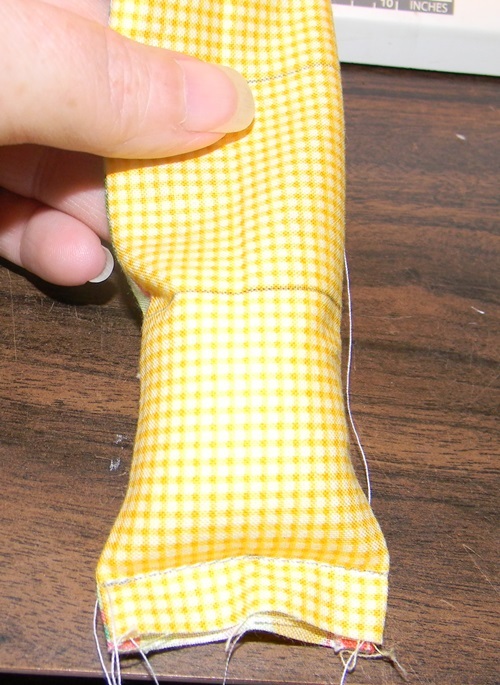 With your 1/4 inch seams on the sides, sew your first seam at the first 1/2 inch mark. Stuff this first section lightly. 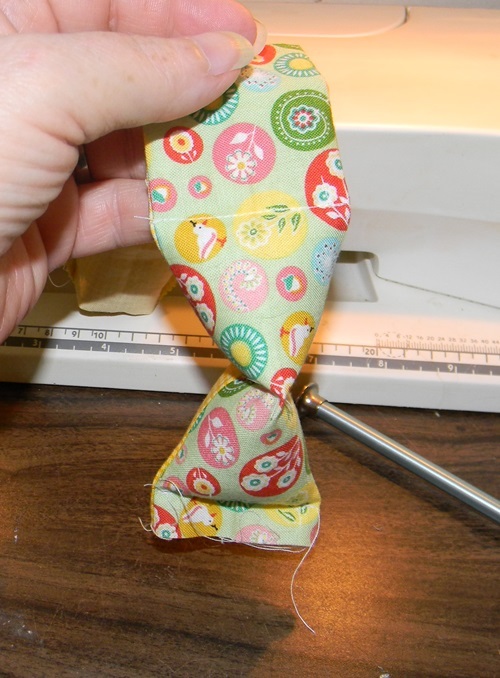 Then match your 1/4 inch seams so that they are in the middle of your tube. 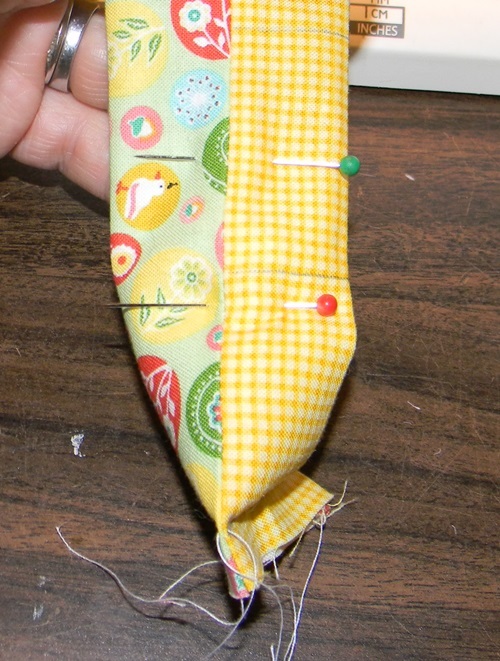 Place pins on either side of your marking and sew. Stuff the next section lightly. 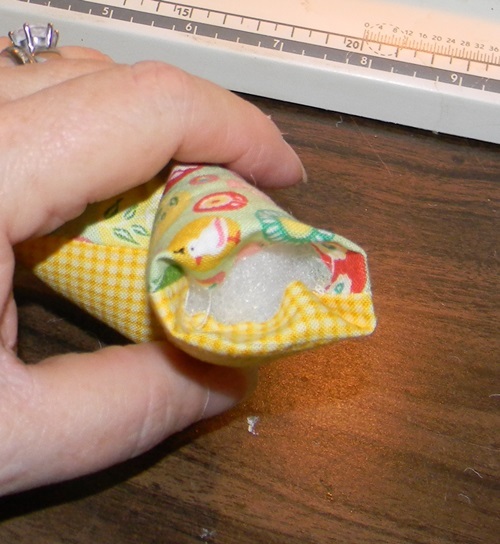 Having the 1/4 inch seams on the side, pin and sew along your next marking. 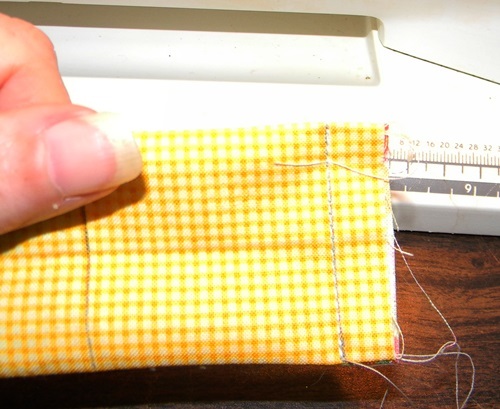 Continue in this manner, alternating the 1/4 inch seams on the sides or in the middle until you have one last section to stuff. 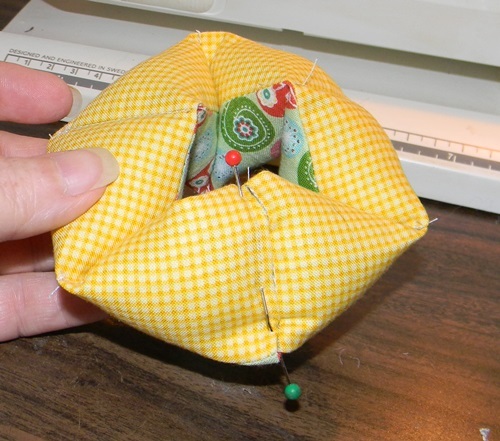 Stuff the last section, but do not sew across the opening. Fold in the end 1/2 inch (on the marking). 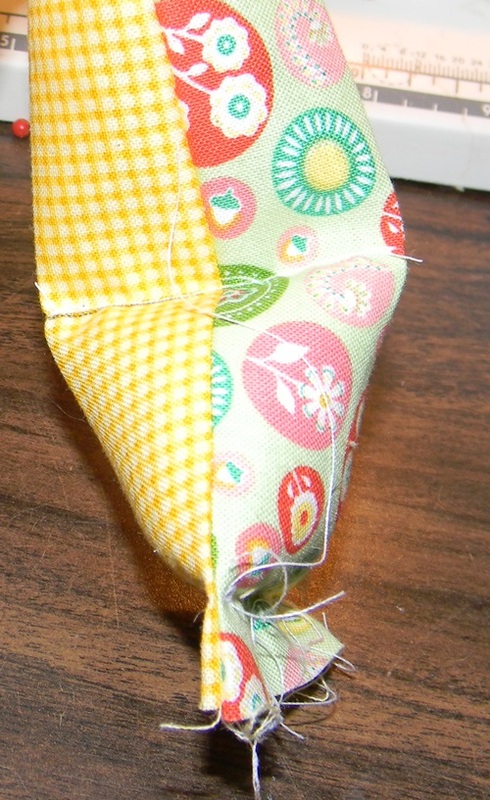 Insert the other end into this folded area and pin in place. 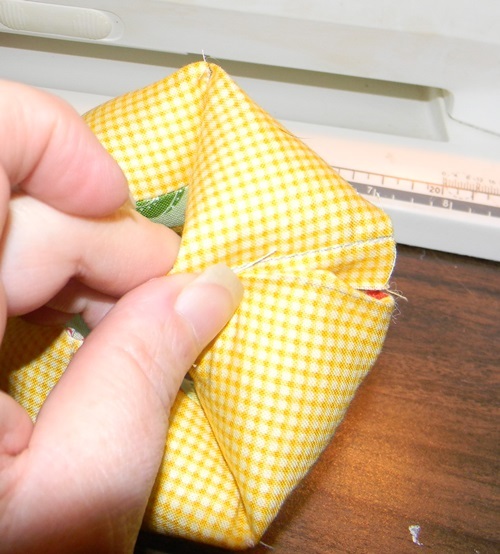 Hand sew the ends together using a heavy duty sewing thread. I used upholstery thread. 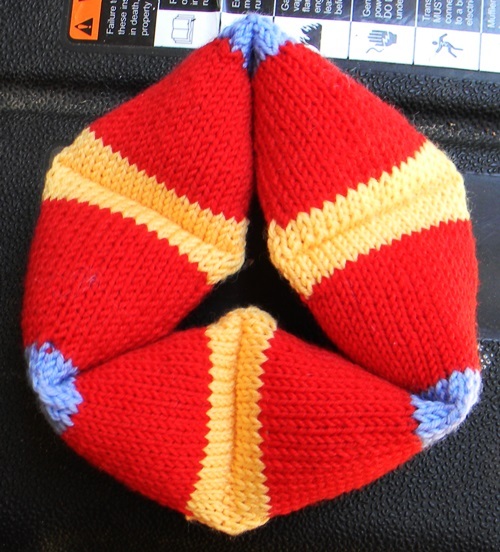 A knitted Kaleidocycle to be exact. I found the pattern on Ravelry and just had to make it. Techniques used are Provisional Cast On (crochet cast on), knitting in the round (clockwise), purling in the round (counter-clockwise), double knitting (knitting both sides at the same time) and Kitchener Stitch (invisible join). It was a fun knit, but somewhat challenging as you have to pay attention to what you are doing. Definitely not something to knit while watching TV. It is a tube made up of Tetrahedrons (pyramids). Each Tetrahedron is joined with a “hinged” area that allows them to fold and be turned. BTW, it is a toy. Here is my completed Kaleidocycle. And this is the YouTube video showing how it works. 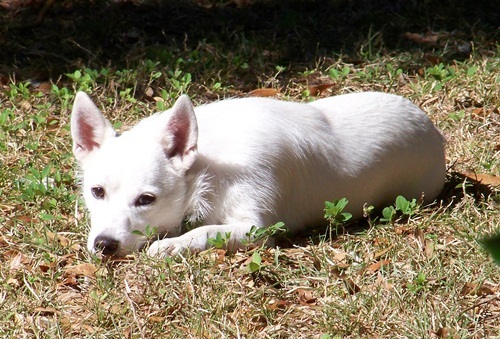 There are some things you should take into account when you walk your dog in the summer heat. l. How hot is the pavement? If it’s too hot for you to stand on barefoot, then it’s too hot for your dog to walk on. 2. Consider going early, really early in the morning before the sun has had a chance to heat up the pavement. 3. Carry some bottled water for you and your dog. 4. Rest if need be on your walk. Observe your dog. If he/she looks tired, stop and rest a few minutes. 5. Try to walk in the shade. Look for a route that is mostly shaded. It will be better for you and your dog. 6. If you jog while out with your dog and the temperature is 80 or above, consider leaving your dog at home in the air conditioned house. Just remember you are not the only one going on this walk. Take into consideration the comfort, health and safety of your dog. Hell, I’m 62 y/o. MOVEMENT is my goal! I don’t want to be pushed around in a wheelchair. I don’t want to fear stairs and have to do that one foot shuffle thing just to get up or down them. I don’t want younger folks to think, “OMG, there’s an old person, shuffling along this walkway. Quick, let’s get around her.” I don’t want to be that old lady at the beach wearing a bikini and have people nearly break their necks doing a double take. I don’t want to be a contestant on The Biggest Loser. I want to be able to control my high cholesterol with diet alone and get off the medication. 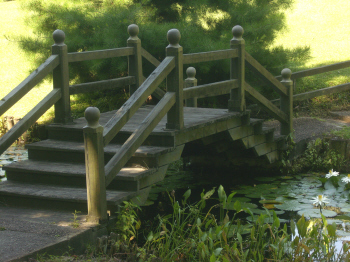 I want to be able to walk up or down stairs without fear of tripping and falling. 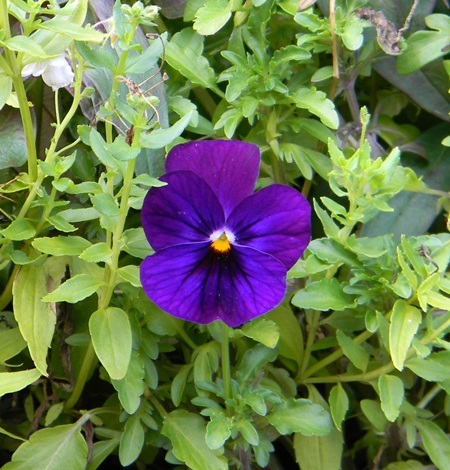 I want to be able to walk around a museum or zoo or garden without becoming winded and having to rest every few feet. I want to be healthy and stay out of a hospital. I want a healthy heart. I want muscles strong enough to pick up a few bags of groceries or a heavy skillet without fear of dropping it on my foot. I want to be able to walk without shuffling my feet like so many folks do in a nursing home. I want to be able to sit in a chair at a restaurant without my a$$ hanging over the sides. I want my internal organs to function as normally as possible. I want to be able to take a trip and not have to sleep for 2 days just to recouperate. I want to enjoy my retirement. I want to be the healthy person younger folks look up to. These are just a few of the things I want. Healthy is my goal, not running some 5k thing. And I am working on my goal. I am walking my dog about 2 miles a day. I am drinking more water. 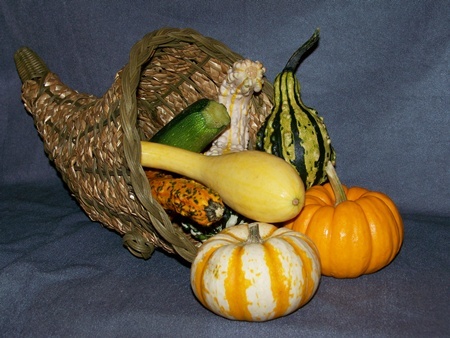 I am counting calories and monitoring the kinds of foods I eat. Yes, I do splurge on occasion but that’s ok. So I will continue with my goals to become that healthy person. The rest will all fall into place in time. I am currently designing a new sock for men. I wanted something that was somewhat generic, but that men would wear. I talked with my youngest son. He said it’s all about color, not fancy stitches. So I came up with a plaid sock. First of all, I worked it out on graph paper. I played around with it until I got it like I wanted. Then I began to implement it. Now I am no stranger to stranded (colorwork or fairisle) knitting. I know it takes longer to knit and it also tends to draw up the width more so than just knitting with a single yarn. BUT, OMG! This sock is labor intensive. I do like the results, but I don’t think I will be making this again. 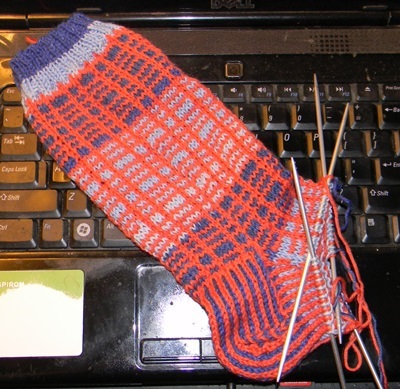 If I do I will only, repeat, ONLY do the plaid section on the top or cuff of the sock and only for a short distance. Figuring out on paper where to change colors is so much different than the actual knitting of said colors. As I said, it is labor intensive. 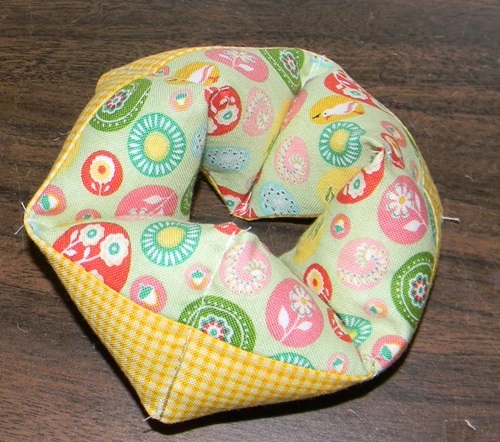 And I still have to write it up as a pattern and place said pattern in my store for sale. After all this work, I certainly hope the pattern sells well. Oh BTW, I call it Mens Plaid PIA Sox. My mother went to Heaven many years ago, way before my own children were born. I still miss her. I often think how she might respond to certain situations in my life and what she would have done under those circumstances. Sometimes I think of the funny things she said throughout my life. My dog, for example, is a mixed breed. She would have called her a Sooner…just as soon be one thing as another. I wonder how she would have liked having 5 grandchildren, all boys, BTW. I think she would have spoiled each and everyone as much as possible. And she probably would have harped on me and my brother to grace her with a granddaughter. She died 30+ years ago, but I still think about her and smile. I think we would be best friends, not just mother and daughter.